Our next destination in Japan was a special one. Kat had done her research and learned about Mt. Koya, a mountain range just south of Osaka that is host to over a hundred temples. 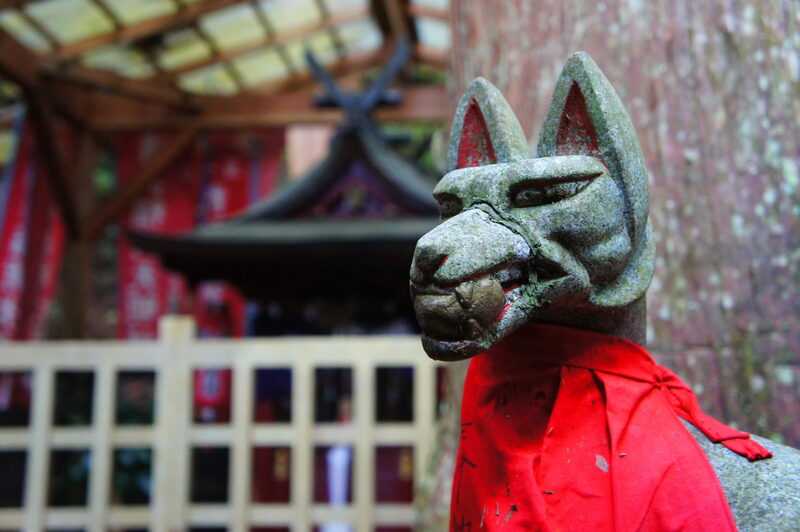 It’s also the centre of the Shingon sect of Buddhism, so it’s a pretty big deal. We roused ourselves at our base of operations in Osaka in the morning and proceeded to make our way to the train station. We were in a hurry as The Missus and I had slept in (again!). Unfortunately, being in a hurry does not provide any advantage in reading Japanese; we accidentally caught one of the non-express (read: slooooooooow) trains to the mountain. This was not anyone’s fault in particular, and especially not mine. 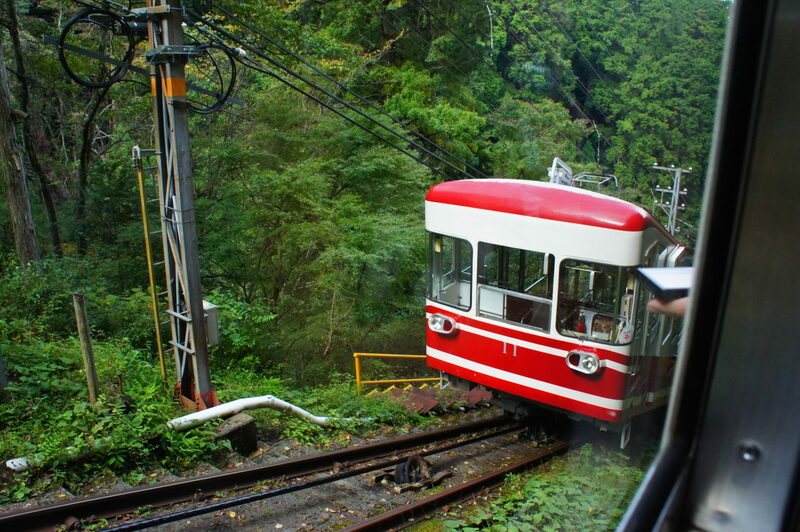 The train eventually concluded its leisurely crawl through the Japanese countryside at the base of Mt. Koya. As it happens, the temples are not at the base of the mountain; we had to take a special tram to ascend. The little electric engine that could. What makes these trams special is that they are built on an angle. 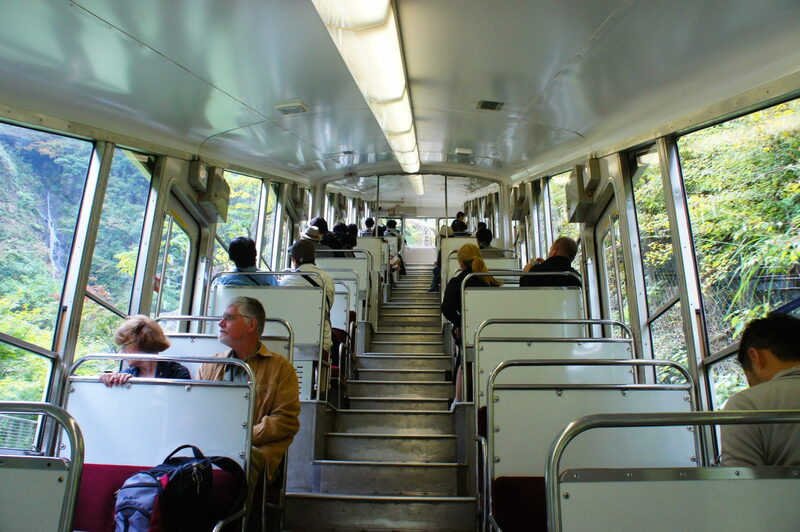 To walk from one end of the tram to the other, you need to climb a set of stairs! I can legitimately say that I took the stairs up Mt. Koya. The tram ride to the top of Mt. Koya was only about 5 minutes long. We were deposited at a station, where we caught a bus down a winding road towards a little town crowded with temples. I am sure that you are eager for photos of these temples. You should be. They are gorgeous. However, by this point we were completely ravenous, so we delayed the sightseeing in favour of the nearest restaurant. The restaurant did not have English menus, but it did have wax replicas of all of its dishes in the front window. Having sated our appetites, we considered booking our accommodations. We decided that there was plenty of time to spend looking at temples before finding a place to stay. This will become relevant later. We left the restaurant in search of temples. It was not a challenging search — there were over 50 temples within walking distance. Although Koyasan is host to a variety of secular buildings (such as the delightful restaurant to which we had just adjourned), the vast majority of all buildings are temples. All we really had to do was walk towards the nearest thing with a roof. So that’s what we did. It turns out that the nearest thing with a roof happens to be Kongobu-ji, a temple which is: 900 years old, a UNESCO heritage site, and the head temple of the Shingon Buddhism religion. A lucky pick. It was just over a bridge, up a path, and through a gate. Most temples have purification fountains out front. Visitors can wash their hands (and occasionally their mouths, though we did not do this) prior to entering the temple grounds. The fountains are often covered in numerous prayer tokens, and Kongobu-ji was no exception. Amelia takes the plunge. Er, ladle. I don’t know what’s inscribed on the ladles, but I assume that it’s related to purification. These prayer tokens were all over the place. Behold: The world’s most adorable spigot. Kongobu-ji has a very old gate (420 years old!). It’s the oldest structure on the grounds (the rest having been rebuilt at various times due to fire), and it looks pretty good for its age. Kongobu-ji itself is pretty big. It has several buildings, shrines, gates, gardens, and so on. We milled about the main courtyard for a little while, just past the main gate. 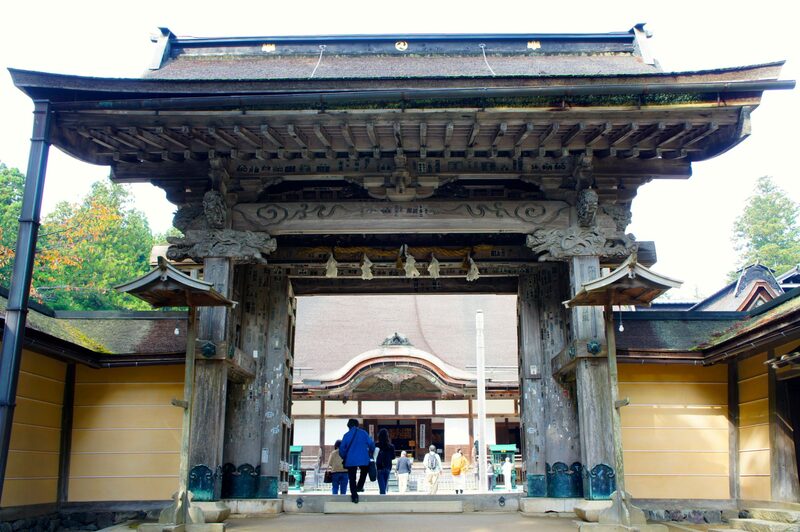 The front entrance to Kongobu-ji’s main temple. I’m… not totally sure what this is, but it looked cool. A side gate towards some more of Kongobu-ji’s grounds. We did eventually go inside. 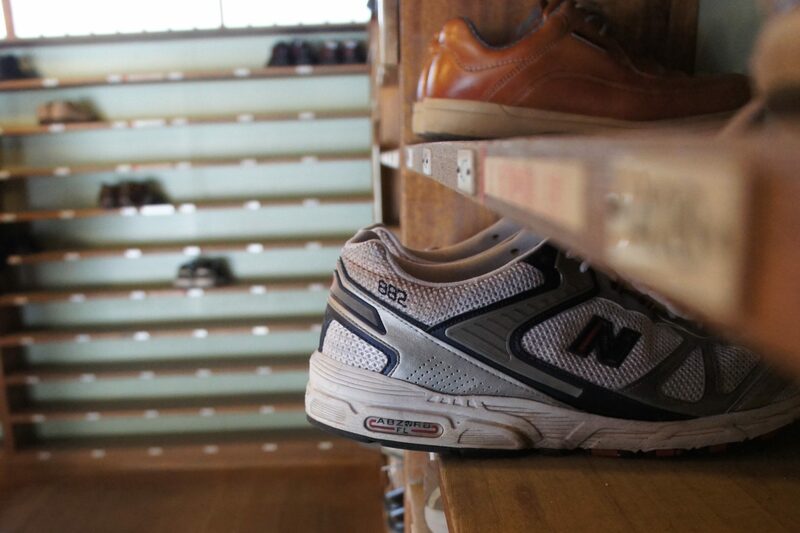 Guests are asked to take off their shoes; the temple provide slippers to walk around in. My slippers did not fit. This is a recurring issue in Japan, but I can’t really blame the Japanese for it; I can barely find adequately-sized footwear in Canada. Japan is not prepared for my feet. 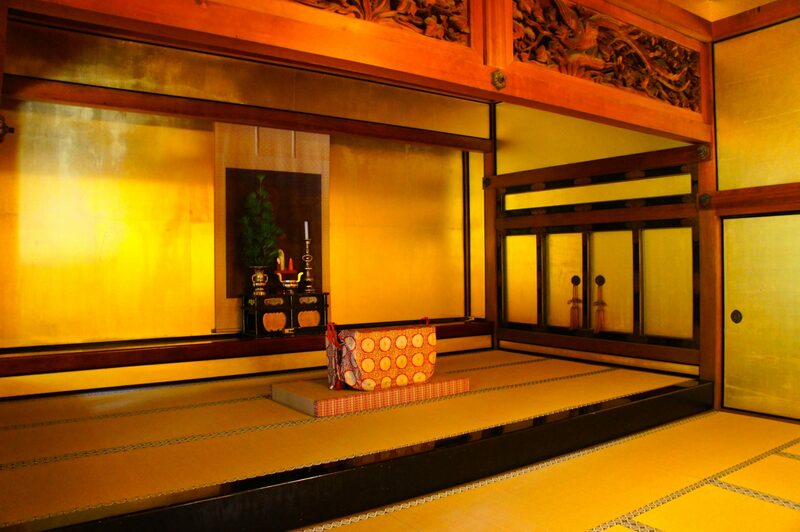 Kongobu-ji is divided into many rooms, each with a different theme, colour scheme, and purpose. The rooms are luxurious, and their walls are covered in depictions of various landscapes and events. Unfortunately, we weren’t allowed to enter these rooms or take photographs of most of them, so it’s hard to give an accurate impression (although some visitors are not so scrupulous). Uh, let’s assume that photos were allowed in this particular room. A garden set into a courtyard in Kongobu-ji. A little shrine up some steps behind the temple. There’s a lot more to this rock garden; it completely surrounds that building. “This garden rocks!” — Every obnoxious tourist ever, including me. 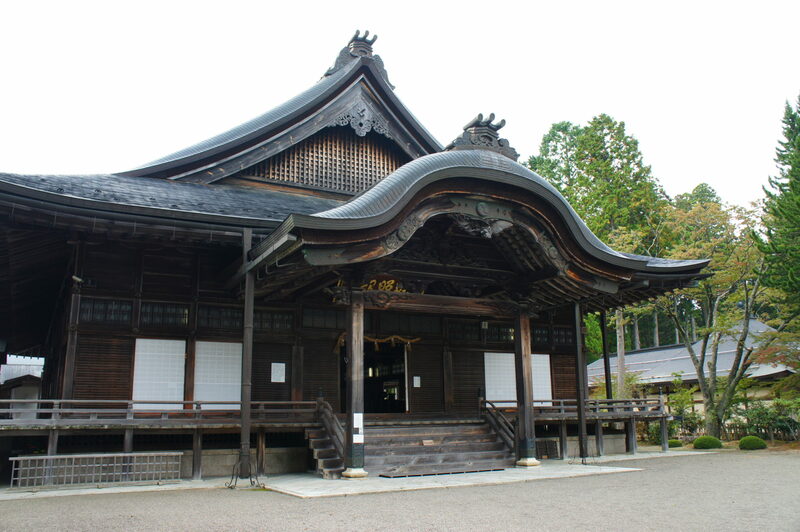 Kongobu-ji is both a tourist attraction and a functioning religious site. Behind the scenes, monks wander about the living quarters, greet business representatives, and maintain the grounds. Surprisingly, we were allowed to walk through parts of the monks’ living quarters, which were much more humble than the opulent painted rooms we’d just walked by. 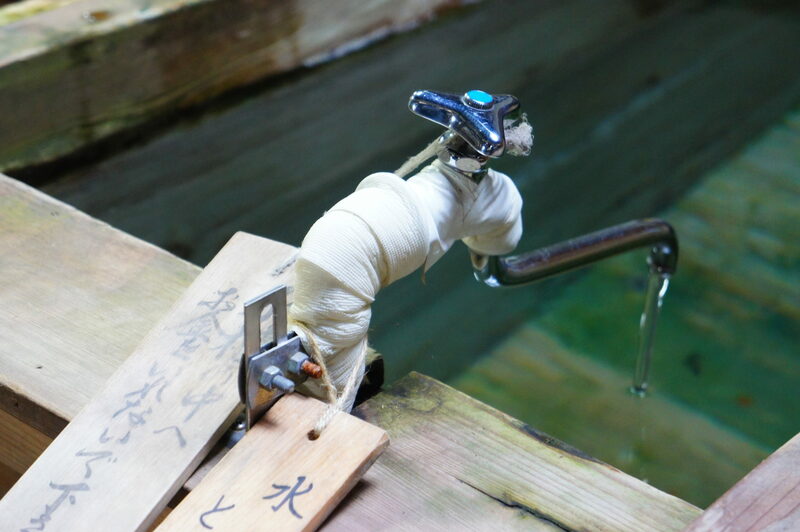 The monks’ purification fountain has a different sort of charm. As we made our way towards the tea ceremony room (which The Missus and Kat were extremely excited for), we encountered a row of monks stamping and inscribing in pilgrims’ books. 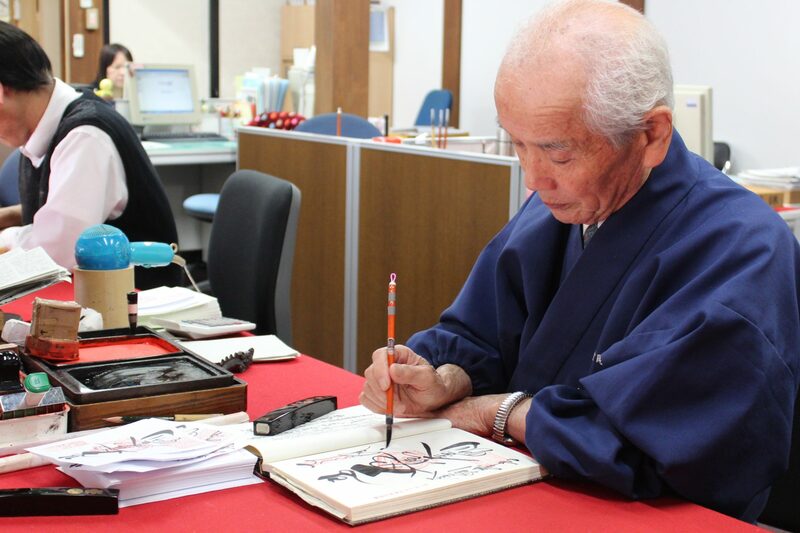 These books are like religious passports — every temple will fill a page with a different set of stamps and calligraphy. Kat bought a book immediately. By the time we left Koyasan, it was practically full. I like to imagine that they’re inserting messages to their friends at other temples. 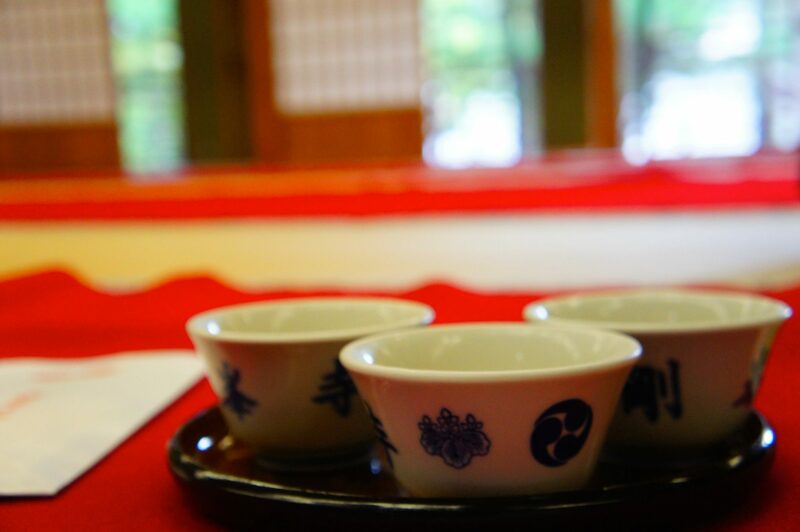 The tea ceremony room is a long room with rows of red carpet upon which to sit and drink tea. I have, like, 10 photos of these cups, but I think one will suffice for now. We left Kongobu-ji in search of Koyasan’s Visitor’s Centre, where we were told that we could arrange for accommodations. We stopped along the way to buy a shirt for The Missus, who was beginning to feel cold. She was not pleased about this – she figured a lifetime of Northern Canadian living ought to make her immune to the relatively gentle chill of this Japanese mountain. Alas, this was not the case. 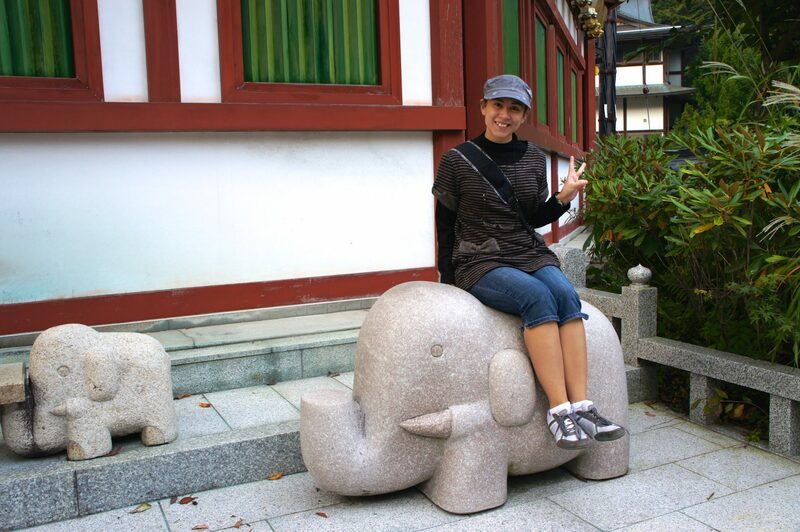 Her rage was only slightly lessened by this adorable elephant statue. Now, here’s the thing about Koyasan: There are no hotels. Visitors stay in temples. We are big fans of sleeping in general, and we are also big fans of temples, so we were especially looking forward to sleeping in a temple. When we found the Visitor’s Centre, we entered with high hopes. When we arrived at the Visitor’s Centre, we discovered that they were just starting to close up the booking agent’s desk. This was very distressing to us, as we were keen to be sleeping under a roof, and a booking agent was a crucial part of achieving that lofty goal. Fortunately, the booking agent very kindly sat down with us, called around to various temples, and eventually found us a room at a nearby temple. Having narrowly dodged a bullet, we resolved to change exactly none of our behaviour, and followed a circuitous path to Shojosho-in, our home for the evening. We were well-rewarded for our obstinance — we stumbled across a pathway of torii gates that lead just off the main road. The gates further back were in slightly different condition. At the end of the pathway was a shrine in the centre of a small clearing. If we had found it later in the evening, perhaps when the sky was a little darker, then the shrine would have made the perfect setting for a horror movie. I mean that in the best possible way. The shrine was open on the other side as well. But it was not late or dark out, and so the shrine seemed like a tiny oasis of silence in the middle of an already-pretty-quiet place. We did not return at night. We found our way to Shojosho-in without incident. 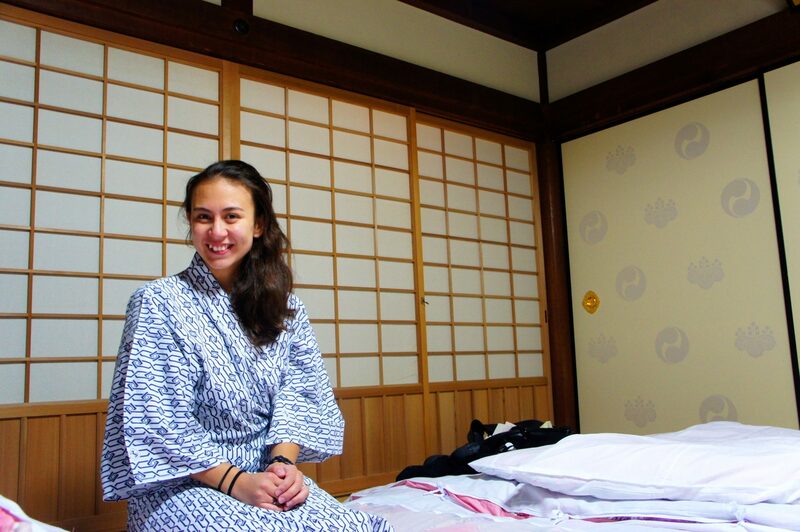 The grounds were gorgeous and our beds were all laid out — we have never been happier to see tatami mats. Our room was stocked with snacks, garmets, and art. Once again, everything works out swell for the clueless tourists. We had arrived just before dinner, which (we learned) is served by temple staff and consists of the same basic foods as are eaten by the monks. That sounded like the perfect combination of effortlessness and authenticity to which all tourists aspire, so we waited for the dinner bell with anticipation. While we waited, we explored the temple grounds. There was plenty to see! Soon the dinner bell was rung, and we hurried off to dinner. 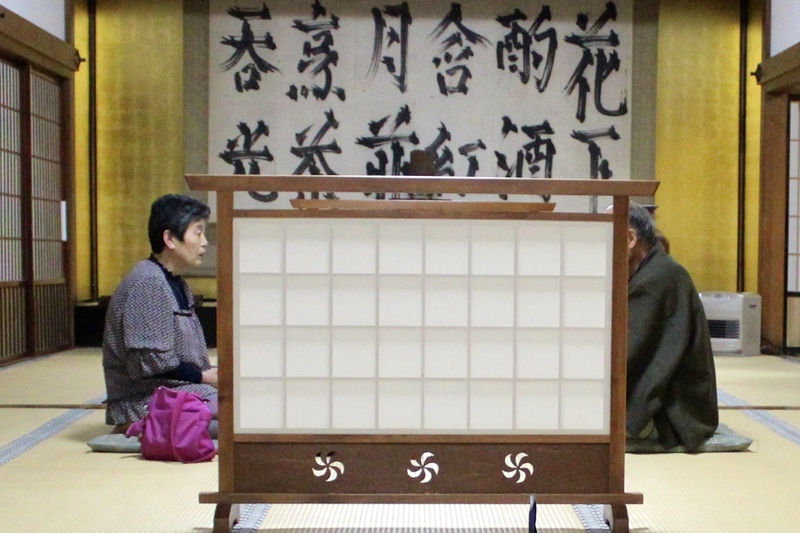 Being a traditional Japanese meal, we were served on tatami mats. The Missus and Kat kneeled, as is traditional. I tried the whole kneeling thing, but after the disaster in Hiroshima (which, as you know, clearly refers to my skinned knee) this had become fairly uncomfortable. The meal itself was vegetarian, which was fine, and was composed primarily of tofu and beans, which (in my gastronomical opinion) was not as fine. I appreciated the chance to experience the sort of foods that our hosts regularly eat, primarily for the reassurance that my choice not to pursue a career as a Buddhist monk was probably a wise one. The presentation was excellent, but I can only eat so much tofu. After we finished our meals, we deliberated what to do next. This is when an elderly Japanese couple approached us and, though a complicated pantomime of exaggerated hand gestures, invited us to join them for an evening stroll. Unfortunately, we did not have the foresight (or, later, the hindsight) to take a photo with the couple. This is sort of amazing, when you consider the “document everything” mentality with which we had been approaching the trip. The couple lead us to a graveyard near our temple. 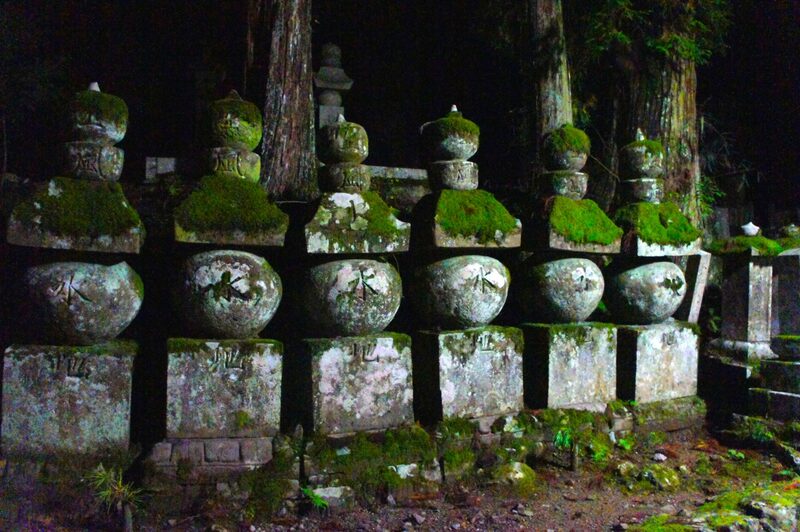 This was no ordinary graveyard – it is home to Okuno-in, the mausoleum of Kobo Daishi. In addition to being an affordable e-reader, Kobo is the founder of Shingon Buddhism, and his grave is considered by many to be the holiest site in Japan. Of course, we discovered all of this the next day. Our guides knew only two words of English — “OK” and “lucky”. Their pantomime game was on point, but not quite capable of providing us with a full description of Shingon Buddhism. As we wound our way through the lengthy path from the graveyard’s entrance to Okuno-in, our guides would stop us at certain places and guide us through their associated religious rites. Each time, they would provide the same compelling reason for observance — “lucky”. At our guides’ direction, we washed our hands at a purification fountain and bowed at Ichinohashi Bridge before entering the graveyard and beginning our two-kilometre trek to Okuno-in. Sadly, being nighttime, very few of our photos of the walk turned out. Only two photos turned out. This one is my favourite. As we walked, one of our guides gestured towards me and made exaggerated shivering motions, presumably in reference to my T-shirt in the cold night air. I am not sure whether this was done in order to express concern, gently mock me, or both. I did my best to communicate that I was not in the last bit cold, being of hardy Northern stock. This was a lie, of course, but from that point on I was committed to stoic endurance. This seemed to impress the guide. Every motion through the cemetery was imbued with meaning. Our guides lead us diagonally across bridges, making it very clear that one must start on the left and end on the right, otherwise we would not be lucky. We circled pillars in a particular pattern, as this, too, was considered lucky. We splashed water on certain statues (which we later learned are called Mizumuke Jizo), thrice on each statue, because any less would not be as lucky. We rang bells and clapped our hands, following the example of our indefatigably cheerful and fortune-seeking guides. We lit candles and planted incense, although it was not clarified whether this is for luck or simply for ambiance. At certain locations, we came across offering halls. Our guides made it very clear that we must toss money in (for luck, of course), but would not allow us to toss our own coins. They pressed their money into our hands and bid us to throw it into the offering trough. We protested, but obliged — it would be unlucky to deny our hosts. This is the other nighttime photo that turned out. It’s OK, I guess. We reached the Gobyonohashi Bridge, the last step before finding Okuno-in. After this point, no photographs, food, or drink is permitted. Again we bowed and crossed diagonally, finding ourselves at the Hall of Lamps (Torodo Hall). More than 10,000 lanterns, each individually numbered, perpetually burn inside the shrine and in its adjacent building. The Hall has been beacon to pilgrims for a thousand years, and some of its lanterns have been lit nearly as long. Our guides lead us into the basement of the Hall, where we found 50,000 small figurines standing in quiet contemplation. We have photos of none of this, but the recollection burns bright in our minds. 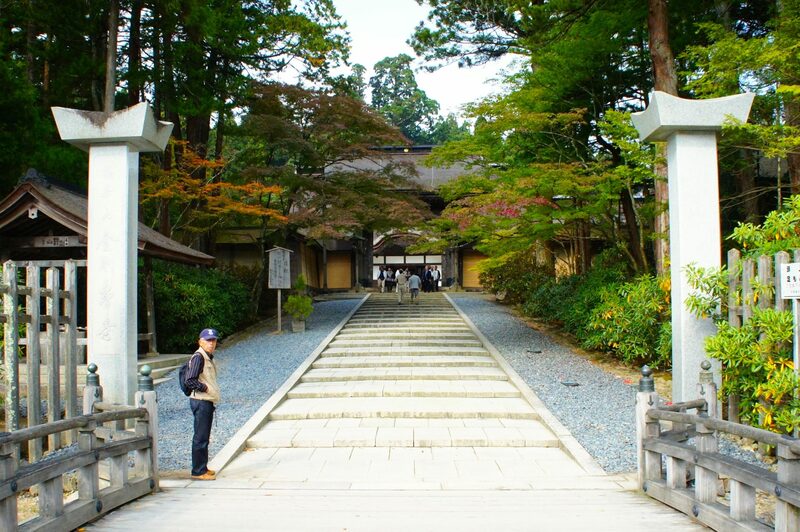 Next to the Hall is Kobo Daishi’s mausoleum, the holiest site in Shingon Buddhism. One of our guides lead us around to a door on one side of the structure and shushed us, explaining (through his mastery of pantomime) that Kobo Daishi is asleep, and we should not wake him. This made more sense when we later learned that Kobo Daishi is believed not to have died, but rather to be sleeping in anticipation of a future Buddha. This helped us better understand the air of reverence around the site. The mausoleum is not merely a monument to a significant religious figure — it is the site of his present slumber and future reappearance. 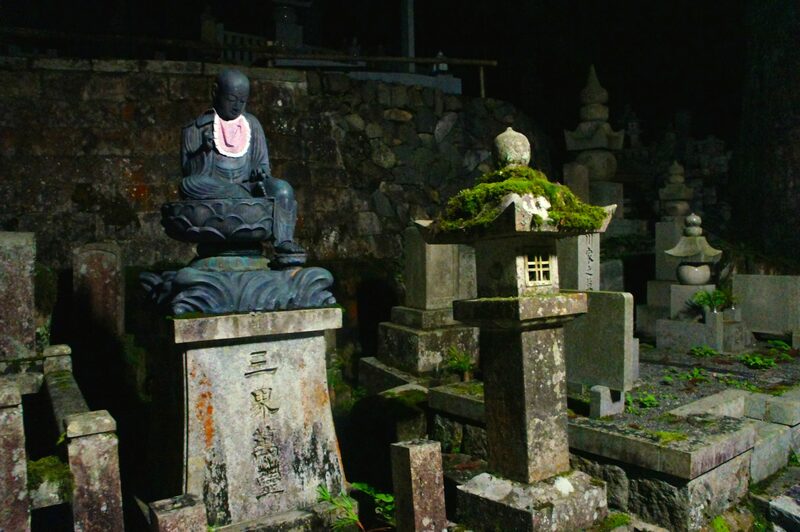 As we left the graveyard’s inner sanctum, we were lead by the Miroku Stone. This is a stone housed in a small cage; pilgrims attempt to lift the stone from a lower platform in the cage to a higher platform. Each of us performed this task with ease, which our guides informed us was very lucky indeed. We made the slow walk back to Shojosho-in, where we turned in for a relatively early night. Except for me — I stayed up to read Neil Gaiman’s American Gods. This was probably a foolish choice (from a time-management perspective), but hey — I was feeling lucky. There were signs saying “this is underwear, do not wear it out of your room”. Scandalous! We got up early the next morning and took a quick, pre-breakfast trip through the graveyard. We were eager to see what the graveyard looked like in the daylight. We were not disappointed — it was exactly as cool as a 1,200-year-old graveyard can be expected to be. We crossed Ichinohashi Bridge diagonally, for luck. We saw a variety of graves, but didn’t make it all the way in to the area of mausoleum. We didn’t want to miss breakfast and the monks’ morning rituals. I like moss a lot. It just seems so… grave. We headed back to Shojosho-in in time for breakfast. I’m… not sure why. The food was remarkably similar to dinner’s, which is what we should have expected. We resolved to head back to the wax-showcase restaurant for lunch, as we were in desperate need of pork cutlet. After breakfast, the monks conducted morning rites. We were invited to attend and observe. After the service was over, we were allowed to wander around the room that the service occurred in. It was just about time to check out, so we took a quick tour of the areas of Shojosho-in that we hadn’t had a chance to see the previous night. Photos were definitely allowed in this room. Probably. I don’t know what this says, but I assume it would make a good tattoo. We visited Japan shortly after the Fukushima nuclear plant disaster. Tourism had taken a beating. 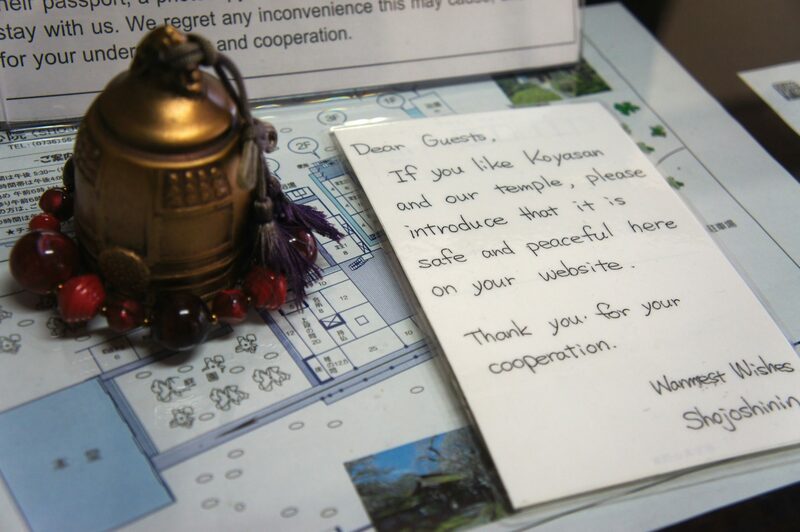 When we checked out, we noticed a little note exhorting guests to advertise Koyasan to the world. And, frankly, I’m happy to do so — although I admit that this post might be more helpful if it were more timely. In case you were wondering, Koyasan is safe and peaceful. I should know, I was there. We headed out from Shojosho-in to explore the other sites of Koyasan. 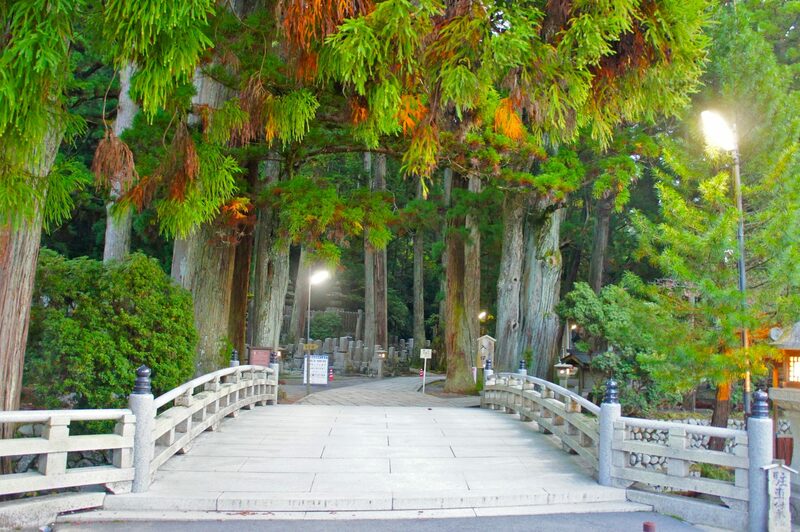 We walked by bright red bridges over placid waters and made our way to Daimon, the Great Gate of Koyasan. Nearby, we found Garan, the Sacred Precinct of Shrines. It is home to the Konpon Daito pagoda, which… is pretty breathtaking, to be honest. Amazingly, this photo is not Photoshopped or edited in any way. 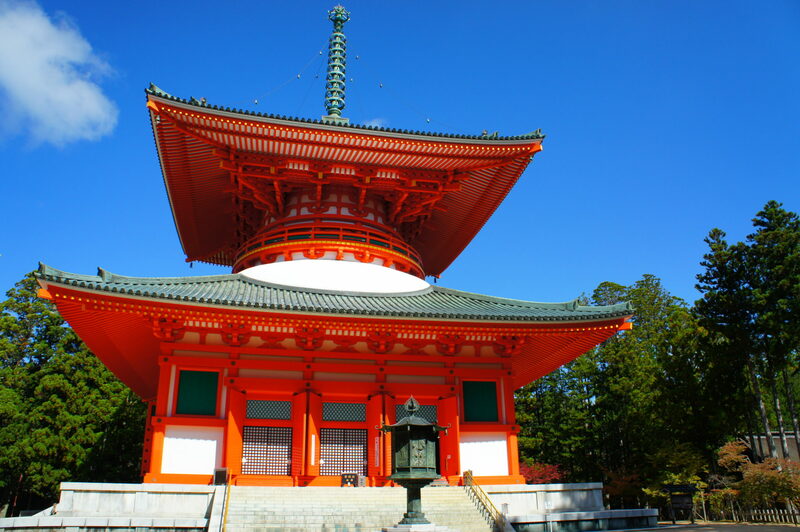 The Konpon Daito pagoda is surrounded by various other pagodas, temples, statutes, and so on. They have their own charm, although it’s hard to measure up to the majesty of the Konpon Daito. We also passed by the Mausolea of the Tokugawas, where the first two shoguns of the Tokugawa shogunate are interred. We had a little bit of time left before we had to leave Koyasan, so we headed back to the graveyard to complete our daytime tour. With our time on Mt. Koya nearly spent, we returned to the wax-sculpture restaurant from the previous day in search of pork cutlet. As it happens, luck was not on our side — they were out of pork. 24 August 2014 11 February 2018 Christopher ScottComments are off for this post.